Obituary for Rev. Thomas Francis Beck | Doolittle Funeral Service, Inc.
Rev. Thomas Francis Beck, 86, of East Haven, husband of Gail (Markman) Beck, passed away on March 16, 2019 at his home. Born in Newark, NJ, he was the son of the late William and Helen (Don) Beck. Tom graduated from Upsala College. After graduating, he served in the United States Air Force for four years. He graduated Seminary school in Virginia where he became an Episcopal Priest. 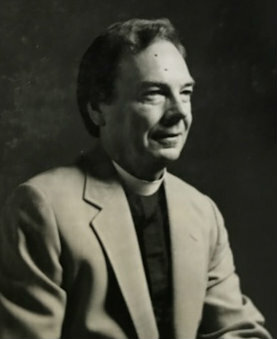 Tom served parishes in New Haven, Stafford Springs, Yantic and the Middlesex Area Cluster Ministry, and also spent many years as a Pastoral Counselor. Tom was very proud of his fifty years of sobriety and how many people he was able to help in AA. In his spare time, Tom loved the ocean and fishing. Along with his wife, Tom is survived by two sons, Mark Beck and his wife, Anna Maria Capestany of Portland, OR and Steven W. Beck and his wife, Jennifer of Cromwell; two sons by marriage, Joseph M. Onofrio of Norfolk, VA and Michael L. Onofrio and his partner, Amanda Petersen of San Diego, CA and seven grandchildren. Besides his parents, Tom was predeceased by his first wife, Marilyn Jean (Litten) Beck. Funeral services will be held on Wednesday, March 20 at 10:00am at Christ and The Epiphany Church, 39 Park Place, East Haven. Interment will be on Wednesday at 12:30pm in Hilltop Covenant Memorial Garden in Cromwell. Family and friends may call on Tuesday evening from 5:00 to 7:00 pm at the Doolittle Funeral Home, 14 Old Church Street, Middletown. In lieu of flowers, donations in Tom’s memory may be made to American Porphyria Foundation, 4915 St. Elmo Avenue, Suite 105, Bethesda, MD 20814. To share memories or send condolences to the family, please visit www.doolittlefuneralservice.com.